The capstone course, which every student pursuing a Computer Information Systems degree will take in their final year of study, offers a two-fold benefit to the students and participating surrounding community. Organizations that volunteer their needs in the website design, development and management arena gain a valuable business tool, while the students who provide the service as part of the class, earn unprecedented life experience. You can give students the mentorship and hands-on experience that will put them ahead of the pack, and win advantageous information and tools that will propel your business organization by getting involved with the capstone course. Dr. David Nickels, who has taught the class for the past six years, said he has had numerous human resources recruiters from various businesses relay that UNA graduates have a distinct advantage over students from universities that do not offer a similar projects course. Everything each student has studied up until they enter this projects-based class is put into practice, building experience and confidence before seeking full time employment. The capstone course revolves around several teams of students who work together to complete a project for live application. Many of the projects submitted and completed are for nonprofit organizations, though the class is not exclusively focused on the nonprofit sector. “We combine learning and working with project management along with completing these projects within one semester,” Dr. Nickels said. Typical projects for these organizations involve website design and development, database development and implementation, and software development. “Participating businesses get to work with students, who tend to have new and fresh ideas. They get involved with the Computer Science department, the College of Business and the university as a whole, and our students benefit immensely under mentorship while completing the projects,” he said. Many of the students continue to work with organizations involved in the class after graduation, either on a volunteer or professional basis. One student, Dr. Nickels recalled, worked with the Helen Keller Birthplace Foundation for the class project and eventually joined their board after graduation. Other students have reported successful job interviews where their potential employer demonstrated deep interest in the program and what they had gained as individuals from the experience. 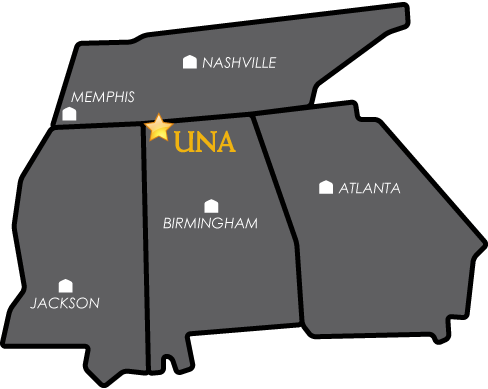 Your involvement in our capstone course will be a win-win for you and UNA. You can give students the mentorship and hands-on experience that will put them ahead of the pack, and win advantageous information and tools that will propel your business organization. Get involved by contacting David Nickels at dwnickels@una.edu.